After observing a vow of silence for ten years in the forest, Krsna Nama Dasa learned from Srila Prabhupada the real value of speech. 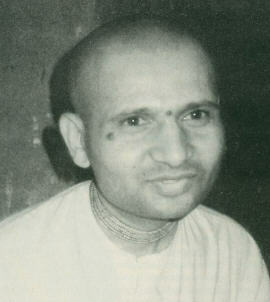 Upananda Dasa: Krsna Nama Prabhu, can you give us some history of how you started your career in Krsna consciousness? Krsna Nama Dasa: I was staying with my maternal uncle in Nasik, Maharashtra. I was born and brought up there. I first heard about Krsna from my grandfather, who liked to sponsor kathas, gatherings where holy men recite scriptures like theMahabharata and the Ramayana. From childhood I would hear from him stories of great saints such as Prahlada and Dhruva. He explained how Prahlada, Dhruva, and Tukarama, the Maharashtrian saint, did so much service for the Lord. One day I asked him what he himself had done for the Lord. He became upset and said, "Who are you to ask such a question? I have not done anything for the Lord. But if you think you can, then you do something great for the Lord." So I said, "All right. I will do something." But at that time I was young and foolish. So I just left home and began to wander from one relative's house to the next until I was fifteen years old. Then I decided I should leave everything and become totally renounced. So I told my family I was going away and would definitely not come back. I took up residence in a forest on the Maharashtra border between Nasik and Surat, Gujarat. It was a peaceful area, and there was a large banyan tree I would rest under. I bathed in a small stream and collected roots and fruit to eat. UD: What kind of roots did you eat? KND: I learned from the Adivasis, the forest tribal people, which ones to eat and which to avoid. In that way I survived. UD: Would you ever go into the town? KND: During my ten years in the forest, every year and a half I would visit Dvaraka and Vrndavana. I would stay in Dvaraka for a week and then go to Vrndavana for a week. UD: And where did you stay when you were there? KND: In Dvaraka I would stay on the bank of the River Gomati. There's a small temple there with a Krsna Deity. I stayed with a sadhu who had taken mauna, the vow of silence. UD: Where did you stay in Vrndavana? KND: Generally in the street. UD: You traveled by train? KND: Yes. I would go to Nasik and from there catch a train in whichever direction I was going. UD: When you were in the forest, was there ever any disturbance? KND: There were tigers and other wild animals, but during the night I was always chanting, so I wasn't ever disturbed. And I was determined to face any danger. From my childhood I had the feeling that God will definitely protect me. Of course, sometimes it was difficult because I kept silent. I would not talk or beg from anybody. I would never ask anybody to give me food. Whatever would come I would take. But one time when I was visiting Dvaraka, after many days on a train I became weak and could not walk properly. So I had a bad fall, and I just started crying, "Oh! What is this life? I have given up everything for God, and still I'm suffering like this!" I went to a pipal tree and lay down. Then from out of nowhere an elderly Gujarati lady came over to me with a plate of wonderful food and said to me, "O Mahatmaji, this plate is for you." Before she came, I had begun thinking ill against my Lord. Despite all my chanting, I was suffering, so I had begun blaming the Lord. Now I became sorry that I had broken my faith and hadn't been able to pass Krsna's test. So I went into a temple and asked forgiveness from the Lord. UD: Then you came in contact with ISKCON? After ten years in the forest? KND: Yes, in 1976, September. I was visiting Vrndavana. Just behind the present temple there was a grove full of guavas. So I would rest there, because my habit was to stay in the forest. Since the garden belonged to somebody, I took only whatever fruits fell on the ground. In that way I had something palatable to eat. I first entered the ISKCON temple one night when I was on my way to Varsana via Chatikara Road, where the temple is located. I heard conch shells blowing so I ventured in and saw a wonderful picture of Srila Prabhupada. I then saw devotees from all over the world dancing and chanting. It was so pleasurable that I soon found myself dancing and chanting with them. They would jump high, and I would try to jump higher. Then some of the Indian devotees started laughing and shouted, "Hey! Mayavadi [impersonalist] dancing! Mayavadi dancing! Ha! Ha!" So I said, "What do you mean 'Mayavadi?' " but nobody replied. So I said I would like to join, but again using the same unfamiliar term they said, "Oh, no. You are a Mayavadi. Come back tomorrow." So the next day, at three o'clock in the morning, I came to the temple, took bath at the temple well, and attended the morning program beginning at 4:30. After I spoke to the president in Hindi, he gave me a place to stay, a dhoti, and a huge, oversizedkurta, which I wore anyway because I was feeling very happy. That day the devotees told me to clean the temple as my service to Krsna. I cleaned the entire temple in eight hours. After that they asked if I would clean the arati paraphernalia, used in the Deity worship. So in about two and a half hours I cleaned all thearati lamps and plates till they looked like new. Then the devotees said, "Very nice. Now go and take some prasadam." I took my prasadam, and when I finished they asked if I could do one more service, which was to clean the toilets. I was not used to cleaning toilets, having come from the forest, so I just put my own hand inside and cleansed every toilet that way. Then they came and said, "Here, we have brought the acid for cleaning the toilets." But when they saw all the toilets sparkling clean, they were astonished and asked how I did it. I told them, "With my hands," and they replied that this was not the way to clean the toilets. I said, "I am from the forest. How can I know?" The next week Srila Prabhupada came to Vrndavana for a few days and gave a class in Hindi. Afterwards he told Lokanatha Swami he would like to send me with the devotees who were going to Mayapur by bullock cart. During our discussion Srila Prabhupada said to me, "Hey, what were you doing in the forest?" So I thought if I said I was there on behalf of the Lord, he might ask what I did for the Lord. And if I said I went for myself, he would have said, "That is useless without any central point in life." So I just couldn't reply properly. Then he said, "Why don't you answer?" But I couldn't, so he started to laugh. He understood my mind, and I could see that. So we laughed together. Srila Prabhupada said, "Why do you want me as your guru?" In reply, I composed a Hindi poem in glorification of Srila Prabhupada. He appreciated it very much. I said that there were thousands and thousands of gurus in the material world, but mostly they are money-minded, of no use. They only want some name and fame. In a poetic way I explained to Srila Prabhupada that the real guru is one who doesn't want anything and gives the real truth. So he said, "Very nice. You will be a nice preacher." I left Vrndavana to go to the next village on the bullock-cart program. Most of the devotees were tired from the long walk the first day and couldn't wake up early the next morning. So I got up by 3:00 and began leading the morning program of worship. When everyone saw that after three days I had learned all the prayers, they were quite amazed. They let me give the lecture, and the local people were appreciative. So Srila Prabhupada's blessings were showing after just three days. The moment I began to preach, I never stopped. I started doing kathas Srimad-Bhagavatam or Bhagavad-gita, whichever the people wanted to hear. So now I am feeling quite nice. Before coming to Pune I was very renounced. I would carry only one bag actually just a cloth with my dhoti and kurta inside. I stayed for eight years in Surat, and when I was asked to go to Bombay I wrapped onedhoti and one kurta and a few other things in the cloth and went to Bombay. The devotees laughed when they saw me. They said, "Oh, you don't have any luggage with you." But I like it like that. Now my health is not so good, but I can speak about Krsna twelve or thirteen hours continuously. Even twenty hours nonstop I can speak about Krsna. Many times I have done that. When I first came to Pune, I went village to village doing programs, and in each one I would talk about Krsna and get great pleasure from it. UD: How long have you been in Pune? KND: I came here two years ago. When I arrived the temple was in big debt. Now everything is paid off, and the progress of the temple is good. The thing is, I never even went out to make members. And I haven't asked for money. People willingly give. I'm living in this small room, and whenever people come to visit the temple I speak to them, and they are attracted to the philosophy as taught by Prabhupada.